Challenging the current status quo through innovative learning models, by providing students with greater access to education and championing the ‘next standard’ for education in Malaysia, INTI International University & Colleges (INTI) held its second annual Academic Conference, themed ‘Hybrid Blended Online: The Future is Now’. Rohit Sharma, CEO INTI International University & Colleges welcomes participants to the Academic Conference. “In just over a year, INTI has successfully blended more than 85% of its subjects, enhancing student engagement and strengthening learning outcomes. 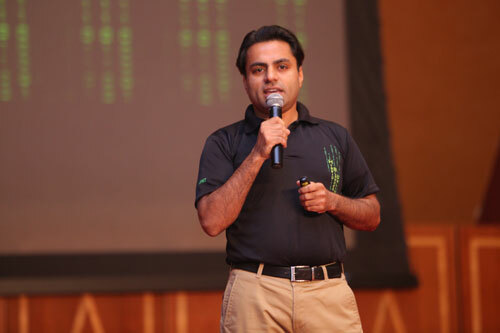 Our exploration of these bold, new approaches is fuelled by our belief that education must change to provide greater opportunities for learning,” said Rohit Sharma, CEO of INTI, during his welcome speech at the event that gathered over 600 of INTI’s academic staff from across the country. “Through technology’s limitless potential, we are connecting more students to opportunities in higher education, empowering them with the skills, knowledge and capabilities required in the 21st century workplace,” Sharma added. Officiated by Y. Bhg Dato’ Prof Dr. Asma binti Ismail, Director General of the Ministry of Higher Education, the objective of the two-day conference was to grow INTI’s innovative learning ecosystem through the sharing of local and international best practices and ideas. 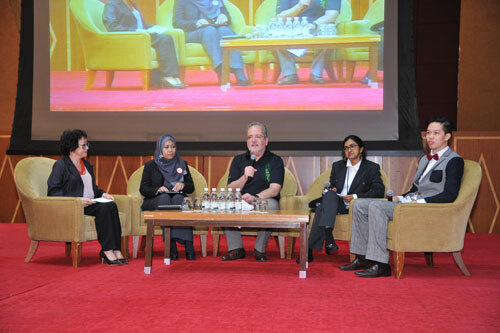 INTI lecturers dicuss Disruptive Innovations during a panel session moderated by Dr Allan Fisher, Laureate’s Chief Academic Office for the AMEA region. Among the lineup of impressive speakers who also presented at the conference were Mr. Amran Hassan, Head of Innovation of Maybank; Rahayu Ramli, Education Program Manager for Google Malaysia; Dr. Allan Fisher, Chief Academic Officer for Laureate’s AMEA region; and Dr. Barry Sugarman, Laureate’s Vice President of Strategic Planning and Product Initiatives in the US. More than 20 INTI academics shared how they have successfully implemented innovation in their teaching during the Marketplace session. These included the creative use of gamification in teaching subjects like organisational psychology, leveraging a group wiki too to improve output in large classes, and integrating pop culture into classroom learning, leading to improved student engagement. “Our close links to industry and the Laureate International Universities network has enabled us to equip our faculty with resources and best practices that help them deliver innovative learning which is truly global. Our academics’ commitment to educational reform has driven INTI’s ability to create meaningful and measurable student outcomes for close to 30 years,” Sharma explains. Due to INTI’s innovative teaching methodologies, in 2014, 97% of INTI’s graduates were employed within 6 months of their graduation, while 16% received job offers even before their graduated. 78% of INTI graduates were paid higher than the market average. “Today’s conference reflects our commitment to being the champion of change in education. Through the development of our faculty, and our innovative teaching methods, we are helping students gain an edge in becoming tomorrow’s leaders,” concludes Sharma.